On the 2nd Sunday in October of every year, hundreds of Polish Texans come to Anderson, Texas to celebrate the annual homecoming bazaar at St. Stanislaus Catholic Church. Make plans to join the fun on October 12th of this year. This year’s event will begin with a 9 a.m. Mass, followed by a barbecue and sausage dinner with all the trimmings will be served at 11 a.m. There will be booths and games for all ages, a raffle drawing with lots of nice prizes and a live auction. The beautiful, historic St. Stanislaus church will be open for visitors to view. Live music by Polish dance band fiddler Brian Marshall and his group of talented musician family and friends for dancing and entertainment from 2pm until dark. This will be the 26th consecutive year that Brian Marshall and the Texas Paradise Band will provide live entertainment for St. Stanislaus bazaar. As always, it will be well worth the trip to Anderson just for the music. Panna Maria (meaning Virgin Mary) is the oldest Polish settlement in the United States. Panna Maria was founded by Father Leopold Moczygemba and about 100 Silesian families from Pluznica, and surrounding villages of Silesia, Poland. The parishioners of Immaculate Conception Catholic Church hold their Annual Homecoming Turkey Dinner every year on the 2nd Sunday in October which is October 12th this year. Bremond Texas is one of the oldest and most well known Polish settlements in Texas. St. Mary Catholic Church holds their annual Homecoming and Bazaar on the 3rd Sunday of October each year. 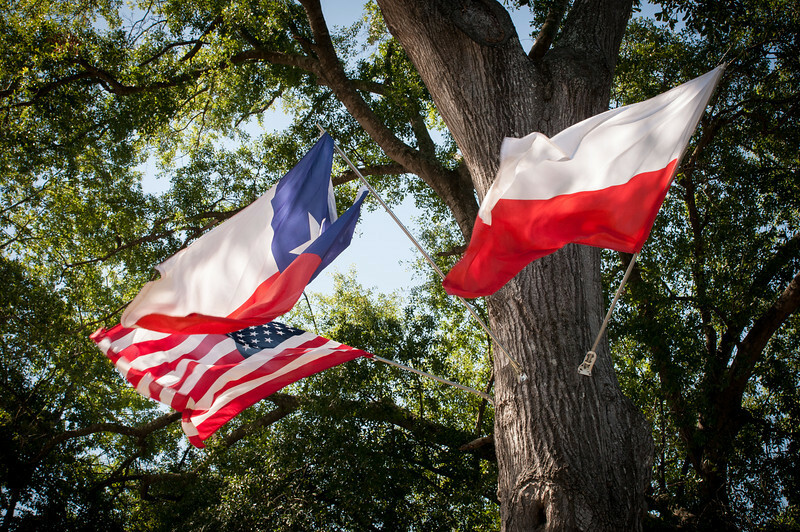 On October 19th of this year, descendants of the early Polish settlers of Robertson and Falls county will come to Bremond for fun, food and fellowship. A delicious barbecue beef and sausage dinner will be served beginning at 11:30 am along with all of the fixings, home made deserts and ice tea. There will be lots of fun and activity for all ages including the Country Store, Toy and Plant Booth along with face painting and hay rides for the kids. The Homemade Goods booth will have lots of delicious Bremond food. There is also a live auction and raffle drawing. Dr. Jim Mazurkiewicz and his Polska Kapela band will provide live entertainment at the bazaar this year. St. Mary’s Catholic Church in Brenham Texas holds their annual Polish Festival on the 4th Sunday of October each year. On October 26th of this year they will celebrate their 24th annual festival by cooking up a delicious home style Polish meal consisting of smoked ham, kielbasa, sauerkraut, potatoes, green beans and pickles along with a choice of czarnina or rosol (duck or chicken soup). There will also be plenty of take home food including popular traditional Polish dishes such as pierogi, kiska and kielbasa Try your luck at the grocery and cake booths and bring the kids for lots of fun activities. Daniel Cendalski and his band, Daniel and the Country Boys will entertain the crowd with a lively mix of Polish and Country music. The Texas Renaissance Festival in Plantersville , which opens on October 11th this year, is one of the most popular fall destinations for fun loving Texans. Because eating good food is an important part of any festival, the Ren Fest has hundreds of food vendors to satisfy the taste buds of just about anyone. Every type of food imaginable resides in the brightly painted shops that line the sidewalks and as you make your way to the back of the festival grounds, you will see a colorful shop that displays a prominent Polish flag along with the Polish Eagle. The Polish Parish of Our Lady of Czestochowa has become the center of Polish religious, cultural, and social life in Houston. The Polish Parish is a place where Polish values are proclaimed and upheld and also a place where Poles and non-Poles can express fully their fidelity to God. They not in any sense a closed community, and welcome all Americans and all ethnic groups in our church. A key Polish value is openness to the universal mission of the Church, and thus we they to make their church a place in which their friends and neighbors of non-Polish background can feel comfortable practicing their Catholic faith and expressing their piety and identity.